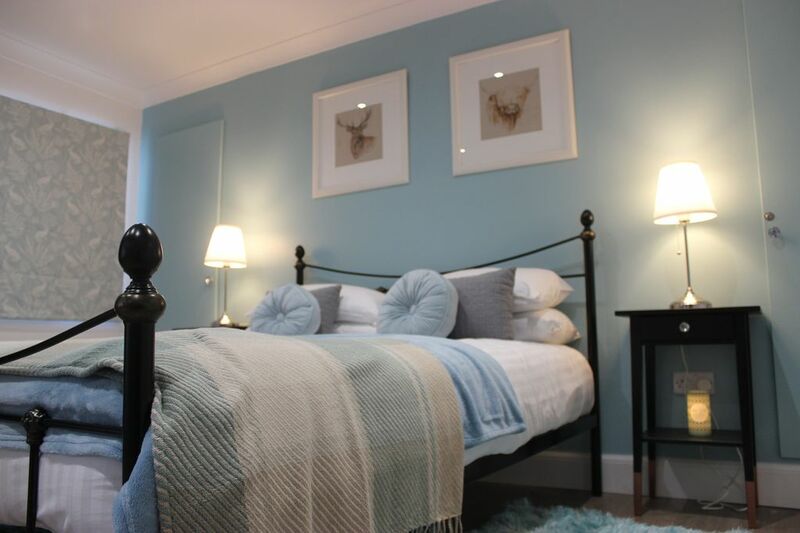 Cobbler's Cottage - a cute, cosy, recently refurbished cottage. Centrally located between Glasgow and Edinburgh, this bespoke cottage has been lovingly refurbished to provide high end accommodation with open plan bedroom, living and kitchen area. The cottage is a two minute walk from the train station and local amenities, baker, restaurant, cafe, pharmacy, mini supermarket and lots more. It is great for couples, solo adventurers, business travellers and families (with kids). Our studio cottage is a mix of modern and Scottish theme decor epitomising open plan living. We provide a comfy king size bed with extra blankets for extra warmth on those cold winter nights. The property has been well insulated and warmth is provided by electric heating. The comfy sofa can also be a sofa bed. You can watch TV on the sofa or in comfort of your bed. Our kitchen is equipped with all the tools for a three course meal if that is something your heart desires. We have a spacious shower enclosure and provide hair and shower gel and conditioner as well as bath sheets and hand towels. At the sink basin you will also find hand wash and hand and body lotion. There is also a heated towel rail in there to warm your towels. We have heaters that are programmed to heat the cottage at set times in the morning and evening but are very easy to adjust. We will provide you with access to broadband upon arrival. Bath sheet and hand towel provided per guest. Living space has a sofa bed, coffee table, television with freeview, armchair and footstool. Spacious fridge to use to store any food that you may require for your stay. Electric fan oven and grill. Simple and straightforward to use. We provide complimentary tea, herbal tea, coffee, sugar and biscuits. We can also supply fresh groceries to be ready for you prior to arrival, at an extra cost. Cutlery and dinner setting provided for 6. We provide all the amenities and crockery that you may need to make your meals - from pots and pans to peelers and corkscrews! We have an adjustable dining table that can be extended to comfortably seat 4 people for a meal. Very modern apartment. Convenient location to all local attractions. Host was very accommodating. Cobblers cottage exceeded our expectations! Tastefully decorated, very comfortable and everything you need for a relaxing break! Would definitely recommend to others! Very close to Dunblane Main Street making a suitable location. Outside of Dunblane's Cathedral and the oldest library, you are only 6 miles away from the historical city of Stirling. Here you will find Stirling Castle, The Wallace Monument, The Battle of Bannockburn Visitor Centre and the Old Jail,. Alongside these historical location there is a the MacRoberts Theatre, the Thistle Shopping centre and many restaurants and eateries. If you enjoy the outdoors and walking then The Ochils are a beautiful location. In Falkirk , a 15 -20 minute drive away, you will find the famous Kelpies within the Helix park. And the Falkirk Wheel along the canal. Glasgow and Edinburgh cities are both about an hour away on the train where you will find more historical sites, attractions, shopping and restaurants.